Red's Shoe Diaries: Hatters Gonna Hat! "Through the Looking Glass" Designer Tea! No need to wear your bunny shoes, but feel free to don your maddest Spring hat for the festivities! 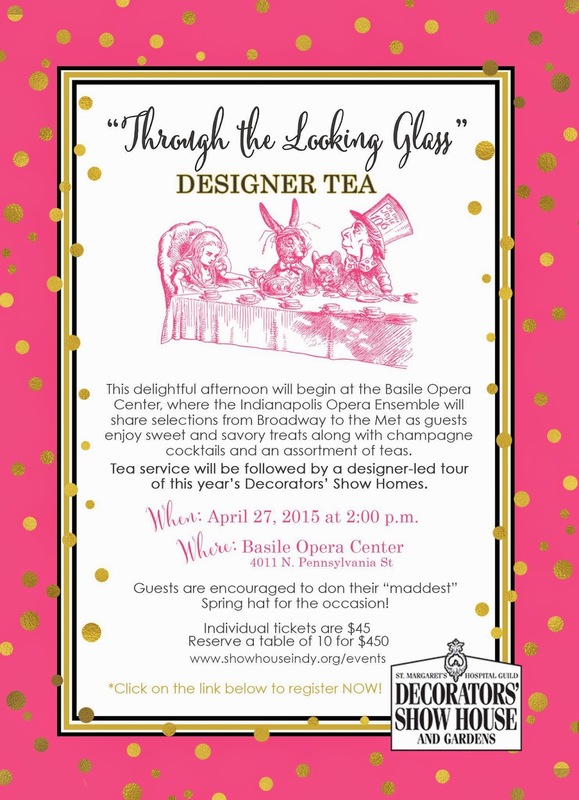 I'm so honored to work with the wonderful women of St. Margaret's Guild to co-chair this very special April 27th event in coordination with the 2015 Decorators' Show House and Gardens. This elegant yet madcap misadventure in design will feature delectable sweets and savories from the Illinois Street Food Emporium and white glove tea service by our small but skilled "Wonderland" staff (you're in for a surprise!) You'll also be regaled by a visit from Alice, the White Rabbit, and the Mad Hatter himself courtesy of the Sapphire Theatre, followed by a selection of songs from the Indianapolis Opera Ensemble that will please even the Queen of Hearts. Finally, you'll be treated to a private tour of BOTH of this year's Show Houses! What's more - all proceeds benefit Eskenazi Health and its services to the underprivileged in our community. Since its inception in 1907, the Guild has contributed almost 11 million dollars to Eskenazi, the vast majority of which is raised through the annual Decorators' Show House and affiliated events. Get your tickets here while they last! Hmmm...I just can't imagine why they thought I would be right the right "hatter" for the job! From an elegant cap to a baseball hat, any chapeau will do...but don't worry, hatless heads are welcome, too! Tickets are selling fast, so get yours today! Hi Lauren, They are Irregular Choice! They are so much fun - thank you! I don't know Jeffrey Campbell but I'll have to check it out!